Nikki Sedacca Gallery is pleased to open for the summer 2018 season with an exciting exhibition, “ Feeling Fresh,” debuting work by two nationally acclaimed artists, Kathe Fraga and Carter Wentworth and featuring new works by Linda Richichi and Joan Konkel. 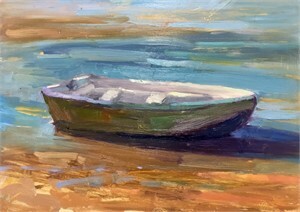 This show seeks to highlight the light, bright, and joyous excitement that builds as the warm summer breeze infuses the salty air to signal the start of seasonal activity on Martha’s Vineyard. 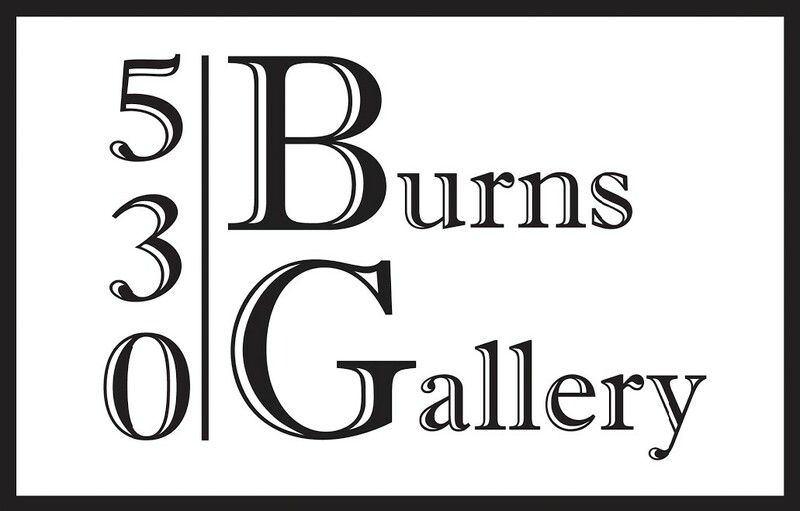 This exhibition features diverse mediums -- from oil paint, to metal mesh and fresco to watercolor -- creating excitement for collectors and art lovers alike. Carter Wentworth paints meticulously and exclusively with watercolor and gouache. With an organic undercurrent, Wentworth draws inspiration from his expansive gardens in Marblehead, MA-- not too far from Martha’s Vineyard. In “Untitled #6” pigmented colors pop from layers upon layers of created dimension. 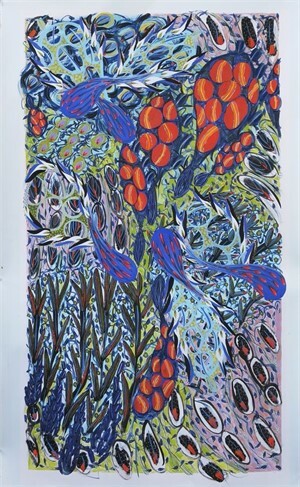 With joyous feeling, Wentworth traces a pathway of thought that was previously known only to the subconscious, connecting the molecular to the physical life forces in nature. Joan Konkel creates three-dimensional wall sculpture from layers of metal mesh. The large windows of Nikki Sedacca Gallery allow light to pour in and across blankets of painted mesh, reflecting the changing sunlight throughout the day. Konkel’s newest work, “Crystal Passage,” is large, 60 x 48, and radiates from the walls, unique and strikingly beautiful, with a variety of subtly and ever changing hues. It never ceases to stop challenging the eye and ask questions about how we perceive and understand the relationship of light and object. Each artist chooses a medium that helps them describe the indescribable. Their artwork enables them to express a beauty felt from within that can be understood and enjoyed by the viewer, perhaps for a lifetime. 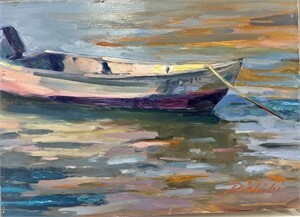 For more information visit nikkisedaccagallery.com. Nikki Sedacca Gallery is pleased to open for the summer 2018 season with an exciting exhibition, “ Feeling Fresh,” debuting work by two nationally acclaimed artists, Kathe Fraga and Carter Wentworth and featuring new works by Linda Richichi and Joan Konkel. This show seeks to highlight the light, bright, and joyous excitement that builds as the warm summer breeze infuses the salty air to signal the start of seasonal activity on Martha’s Vineyard. This exhibition features diverse mediums -- from oil paint, to metal mesh and fresco to watercolor -- creating excitement for collectors and art lovers alike. Kathe Fraga paintings embody the enchantment of french wallpaper and Chinoiserie while maintaining a modern twist. With a nod to the past and an eye for current imagination, Kathe Fraga creates intriguing textures and themes of love and romance that dance throughout each frescoed panel on which she paints with acrylic paint and gold leaf . In “Garden Dreams,” the eye travels from a remnant of a blooming hydrangea to a pair of stylized love birds gracefully resting on a branch. The background colors are subtle and soothing blues and greens, yet pops of valencia orange highlight the playful spirit found throughout her body of work. Carter Wentworth paints meticulously and exclusively with watercolor and gouache. With an organic undercurrent, Wentworth draws inspiration from his expansive gardens in Marblehead, MA-- not too far from Martha’s Vineyard. 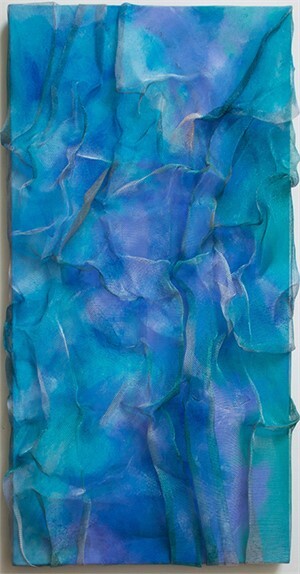 In “Untitled #6” pigmented colors pop from layers upon layers of created dimension. 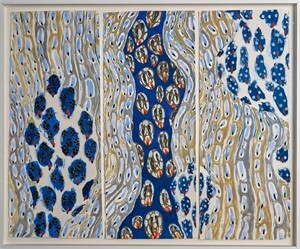 With joyous feeling, Wentworth traces a pathway of thought that was previously known only to the subconscious, connecting the molecular to the physical life forces in nature. 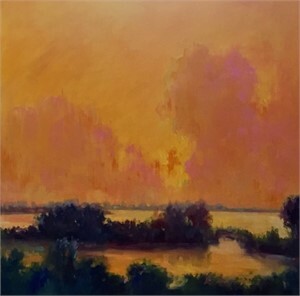 Known for her ability to create energetic “plein-air” oil paintings, where color captures distinctive feelings, Linda Richichi’s paintings transport the viewer to an idyllic landscape. 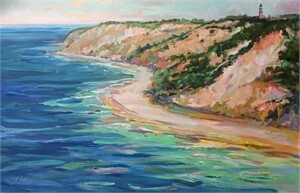 Works depict iconic Vineyard locations such as the Aquinnah Cliffs, relaxing seascapes, and tranquil moments on the shore. 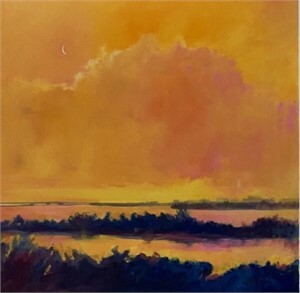 Her current body of work features a diverse color palette, including vibrant oranges found in “Tangerine Sky I & II.” This diptych features a marsh landscape, saturated by fervent color. 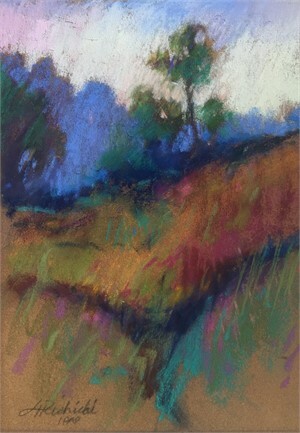 Though powerful, the hues calm, rejuvenate, and captivate the viewer. Joan Konkel creates three-dimensional wall sculpture from layers of metal mesh. The large windows of Nikki Sedacca Gallery allow light to pour in and across blankets of painted mesh, reflecting the changing sunlight throughout the day. Konkel’s newest work, “Crystal Passage,” is large, 60 x 48, and radiates from the walls, unique and strikingly beautiful, with a variety of subtly and ever changing hues. It never ceases to stop challenging the eye and ask questions about how we perceive and understand the relationship of light and object. Each artist chooses a medium that helps them describe the indescribable. Their artwork enables them to express a beauty felt from within that can be understood and enjoyed by the viewer, perhaps for a lifetime. 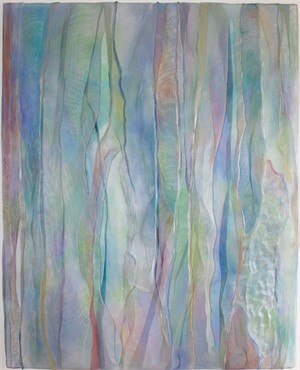 For more information visit nikkisedaccagallery.com.